This bay front upper Bungalow is perfect for you and your main squeeze to escape from reality for just a bit plus your 2 children or best friends or parents as we now have a sofa sleeper in the living room. Each room in this upper penthouse is designed to see the spectacular water views. The Cal- King size bed in the Master Bedroom enjoys a scenic outlook of the water through the sliding doors that lead to the expansive bay front deck. You can roll right out of bed in the morning (or afternoon - you ARE on vacation) and enjoy the sunshine in your pajamas. The loft-style kitchen is fully equipped with service for 6 and has all the necessary appliances for preparing excellent meals. It steps right onto the oversize deck which includes a BBQ, patio furniture, new awning and a fire pit. Great for appreciating the view while you make your morning coffee or watch the reflection of the setting sun in the evening. 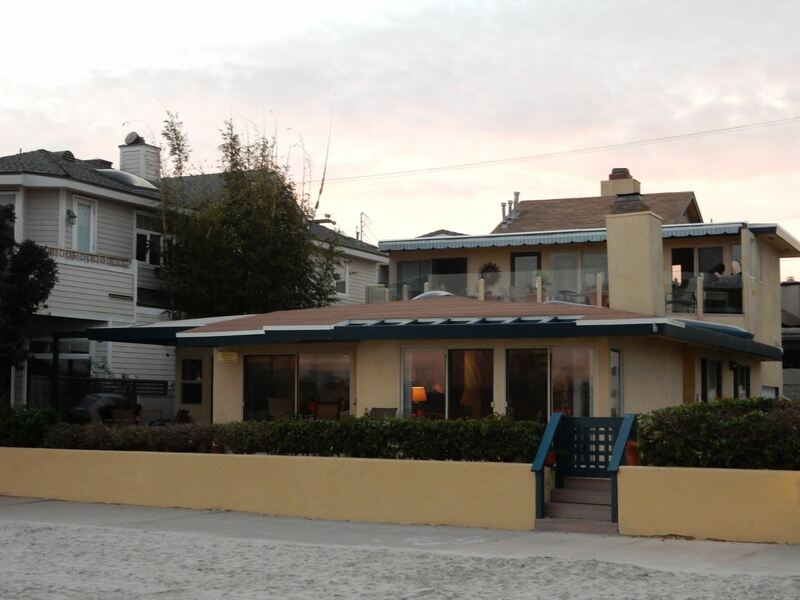 Located at 2892 Bayside Walk, the Bungalow is only a few minute walk from the famous Belmont Park . Feeling adventurous? Check out the Giant Dipper, San Diego’s only wooden water-front roller coaster! For a relaxing evening, the sunken living room includes a flat screen HD cable TV, cathedral ceilings, ‘Light in’ blinds, Wi-Fi, plenty of seating in a bright and fun Mexican-style Sea motif. The bathroom is a must-see with custom tile work throughout and a cool & practical walk-in shower. A private closet washer/dryer and central vacuum complete the list of amenities that this little gem has to offer. The one car garage is right beneath the home and large enough for you vehicle and the bikes we provide. We had a great time at the Bungalow! we had a wonderful beach week. everything was outstanding! many thanks! It is a great place and we love the deck!! We just loved our stay at this bungalow at Mission Beach in May. It was all and more than was advertised. The Condo site on the bay is excellent, quiet a had a "neighborhood feel" (as compared to Pacific Beach), and we found it quite interesting, with people/dog watching & paddle boarders & sail boat watching from the magnificent large deck. We found everything we needed in the kitchen and living area, not to mention the very comfortable king size bed and wonderful fluffy pillows. It was also wonderful to have a washer and dryer facility right in the unit, very convenient. We would love to rent this unit when we vacation again. 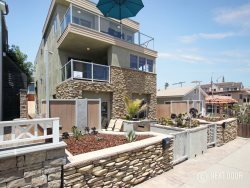 As our son lives in San Diego, we visit the area once or twice a year and hope to contact you with a request to rent this unit again. You and the Pacific Sunset Group, were so accommodating with a few requests we did have. Your attention was much appreciated -- and which is another plus to renting from you.